With Adaxes, you can enforce various constraints on the data entered in Active Directory. For example, using Property Patterns it is possible to validate property values with regular expressions, specify a list of allowed values for a property, make a property required, etc. However, sometimes that's not enough. 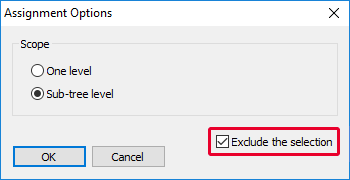 For example, you may want to ensure that the employee ID specified for a new user is unique in Active Directory, verify that the HR database contains a record for the user, add a digit to the username if it already exists, etc. This can be done with the help of PowerShell scripts. 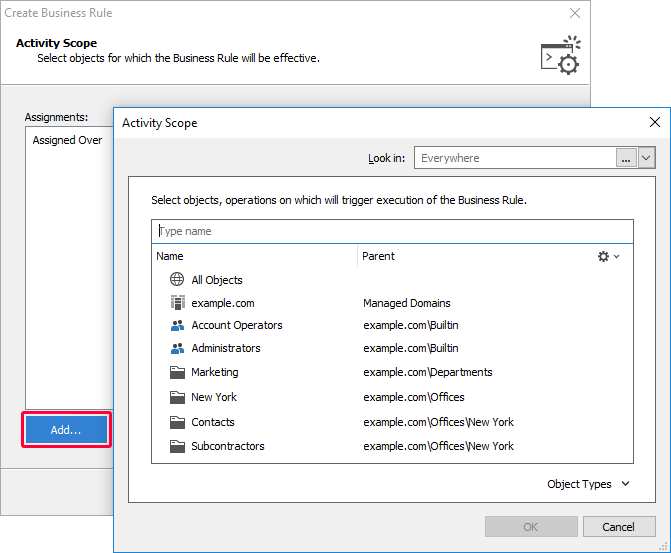 In this tutorial, you will learn how to create a Business Rule to automatically execute a script before a user account is created in Active Directory, and how to use the script to validate and modify the information entered for the user. To get information about the user you can use value references (e.g. %username%). Value references will be replaced with corresponding property values of the user account. To get and update user account properties and control operation execution, you can use a variable called $Context. It is a predefined PowerShell variable of type ExecuteScriptContext. To determine whether a value was specified for a property, call the IsPropertyModified() method. To get a property value, call the GetModifiedPropertyValue() method. To update a property value, use the SetModifiedPropertyValue() method. $newValue = $newValue + "1"
To determine whether the user's password was modified during the operation, use the IsPasswordChanged() method. To get the new password, call the GetNewPassword() method. To cancel the operation, call the Cancel() method. To add a record to the operation Execution Log, use the LogMessage() method. The second parameter of the method can take the following values: "Information", "Warning" and "Error". To get the domain name of the user, call the GetObjectDomain() method. The method takes the distinguished name (DN) of an object as the input parameter. To send an email or SMS message, use SendMail() and SendSms() methods. To use the script, you need to install Adaxes PowerShell Module on the computer, where your Adaxes service is running. 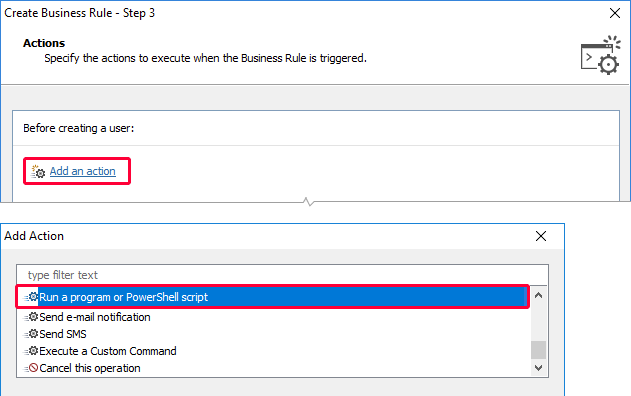 For more information on how to create scripts for Business Rules, see Server-Side Scripting. For information about the cmdlets included in the Adaxes PowerShell module, see Adaxes PowerShell Module. Optionally, you may want the Business Rule to run the script only if certain conditions are met. In the Condition Parameters section specify Employee Type - equals - Subcontractor. You can also use scripts to check conditions. Select the If PowerShell script returns true condition. 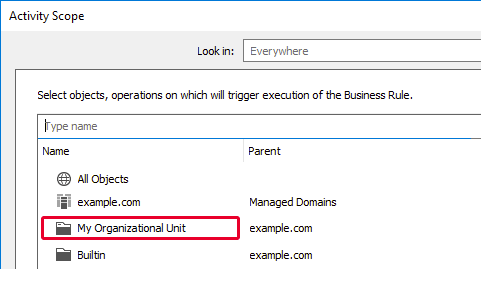 $connectionString = $connectionString + "Integrated Security=SSPI;"
All Objects - select to execute the Business Rule when a user account is created in any domain managed by Adaxes. 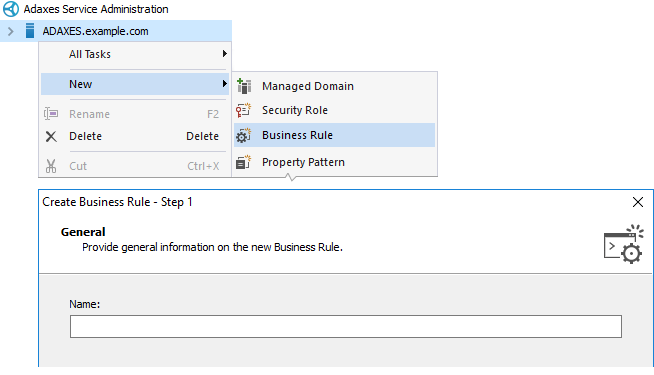 Specific Domain - select to execute the Business Rule when a user account is created in a specific AD domain. 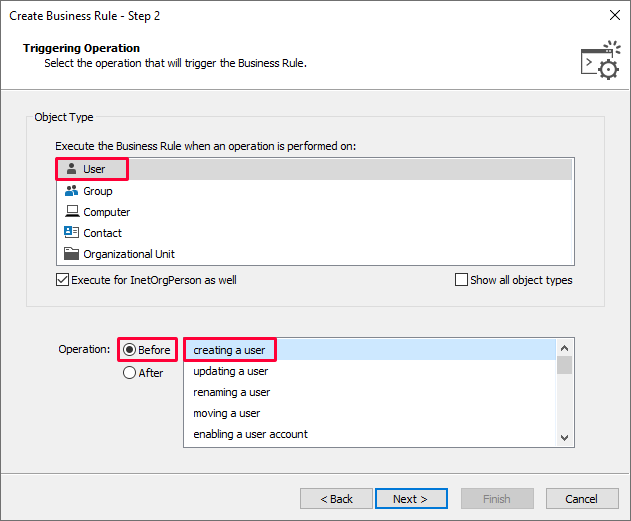 OU or Container - select to execute the Business Rule when a user account is created in a specific Organizational Unit or container.